A low-key drama reflecting on life, Youth toys with many deep themes but never quite commits. 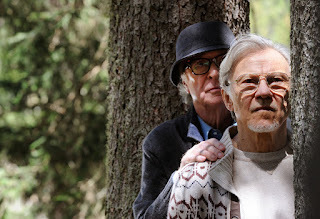 Fred Ballinger (Michael Caine) is a retired classical music composer and orchestra conductor, vacationing at an exclusive Swiss spa with longtime friend Mick Boyle (Harvey Keitel), a film writer and director. Fred's daughter Lena (Rachel Weisz) arranged the spa vacation and is in a serious relationship with Mick's son. Fred is content to focus on quiet relaxation and otherwise do nothing, and rebuffs attempts by the Queen's representative to perform at a royal celebration. Mick still hopes to write and direct a film with his frequent collaborator actress Brenda Morel (Jane Fonda). Other guests at the spa include actor Jimmy Tree (Paul Dano), who is resentful the public knows him only for his most frivolous role, an exceptionally overweight former star footballer, and a beauty queen. As the vacation progresses Fred expresses his sorrow at the loss of his wife, Lena freely admits her disappointment in her father before encountering a shock of her own, and Mick struggles to finish his screenplay before coming to terms with the status of his career. Set almost entirely within a lavish upscale resort nestled in the scenic alps, Youth is full of rich visuals and piercing artistry. Director and writer Paolo Sorrentino is as interested in capturing stunning images as he is in recounting a story, and the film is frequently punctuated by exquisitely rendered tableaux featuring people and places almost suspended in time. Many of the creative shots focus on tertiary characters and have little to do with the main characters. As for the content, Youth is more about commentary and exposition than traditional plot points. Life-long friendship, tension between father and daughter, recognizing the essence of retirement, and reflecting on life's achievements, losses and regrets are the prominent themes. The threads are only loosely tied together, and Sorrentino is happy to vaguely wave at the glistening recollection of youth from the opposite end of life's journey as a unifying concept. With both Fred and Mick at the twilight of life, there is precious little space for characters arcs, and so the film settles for soulful backward glances. Eschewing flashbacks, Sorrentino relies on his cast to convey the past through the words and actions of the present. Michael Caine is more comfortable with a soulful role celebrating the great compositions and performances in Fred's memory. Harvey Keitel is required to stray just a bit too far from his traditional level of comfort in hardened roles. Despite light touches of humour acting as a spice, the abundant creative imagery prolongs the running time to over two hours, and Youth inevitably suffers from slow pacing. The eclectic guests overstay their welcome, but they look good doing it.